Posted October 4th, 2013 by Hoffy Cycles. The flat tyre is an infuriating thing for motorists and cyclists alike. It’s even worse for bike riders when a flat bike tyre leaves you stranded without a spare – something we wouldn’t wish on anyone. But what if there was a tyre where you could have supreme confidence with its performance and be spared replacements while having increased safety on the roads? Here at Hoffy Cycles we are delighted to be stockists of the new technology in bike tyres – Tannus Tyres. We explain the latest revolution in bike tyres in more detail in this post. How are the tyres made? Tannus Tyres are made with cutting edge polymer technology and constructed using solid rubber. These airless tyres are unlike other any of the rubber puncture proof tyres of the past in terms of their grip and comfort when riding. This means that since 2003 when the initial developmental research was conducted in Korea, right until the product was officially launched in 2011, the research into developing the materials used for optimum performance has resulted in a tyre that’s been put to the test in terms of safety, comfort and durability. No air in the tyre means no punctures. Because there is no air in the tyre there is an ‘inner tube’ is not required. This means that even if nails or other sharp objects including stones or glass manage to penetrate the rubber, this will not impact on the ability to ride. 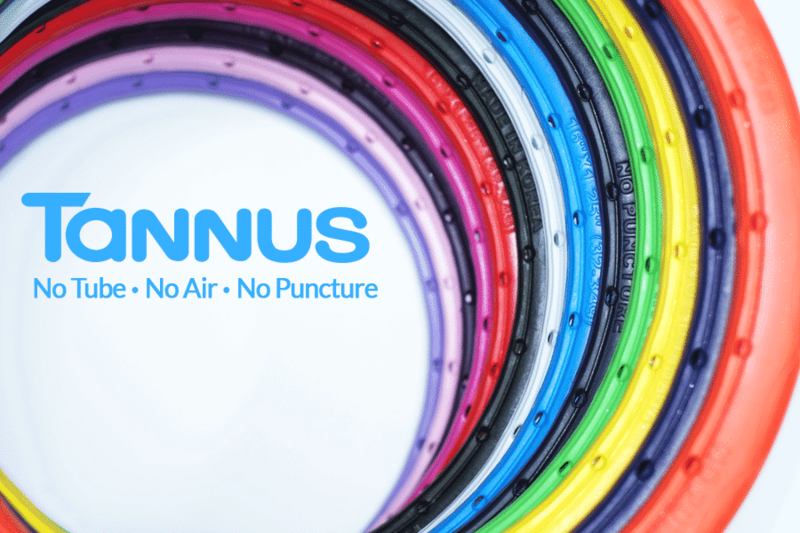 If your bike has the existing clincher type rims, Tannus Tyres can be fitted right away regardless of the size of the rim. Due to their pin locking system, Tannus Tyres can be fitted securely and quickly. Here at Hoffy Cycles in our bicycle workshop we are able to fit new rims to be compatible with these tyres. Forget having the choice of only black and black when it comes to your bike tyres. You can make your tyres really stand out with the 13 colours available including bright yellow, orange red, green, blue and purple. You can even mix and match having two colours – one for each wheel, or match or contrast the tyre colour with the colour of your bike’s frame.